A lovely spacious apartment on the 3rd floor of a 4-storey block (lift access), with two twin bedrooms, one with sea-view balcony and a 5th full size bed for use when required, air-conditioned for cool summer nights & warm winter evenings. 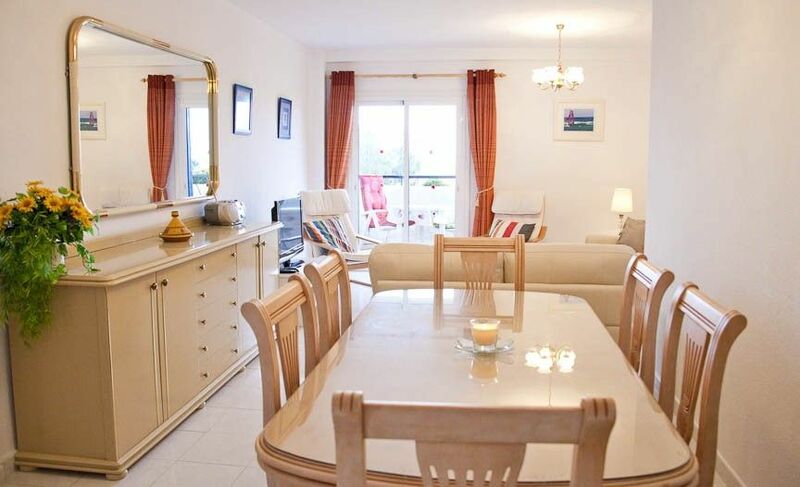 Bright, spacious living & dining room leads onto the main apartment balcony with garden, pool and sea views. Spacious bathroom and also additional shower room, modern fitted kitchen with separate eating area, all mod cons, utility room washing machine and drying facilities. Full size 25m pool with separate children's pool set in manicured gardens. The pool is open from 1 June to 30 September each year. Qualified lifeguard on duty during all pool opening times. Just outside the complex can be found the bars, restaurants, shops & 5 mins to the large commercial centre El Zoco and 5 mins walk to beach this apartment is ideal for those who like everything close by yet staying in a quiet complex. The complex also has secure resident’s car parking but a car is not essential due to the excellent apartment location. Apartment location : Only 30 mins door-to-door from Malaga airport this spacious, newly refurbished apartment is ideal for a relaxing holiday yet it is close to all amenities in the town of Calahonda and approx. 10 kms from the bigger tourist towns of both Fuengirola and Marbella. Set in manicured gardens comprising a full size 25m pool along with separate kids pool the gardens also have shaded areas under trees for those long hot summer days! Amenities Close By: Just a 2-3 minute walk from a range of restaurants and bars in the residential town of Calahonda the apartment is ideally located for all your holiday needs and does not require use of a car. A major supermarket, banks and the beach are located 7-8 minutes walk away. And not to be missed is the beautiful little marina of Cabopino just a walk on the beach away. Sights by Car: For guests with a car Calahonda is located in the middle of the Costa del Golf with 30-40 golf courses are located within a 45 minute radius. The historic hill town of Mijas (20km) has breathtaking views of the coast, with Fuengirola and Marbella (c.10km) great spots for beach, shopping and nightlife. A local bus service also serves these towns and more. We purchased this property in order to have a place in the sun and this particular apartment because of its location and its very large & spacious size. The location is wonderful, located at the bottom of the sometimes hilly Calahonda, it's location means that we never have to hire a car, only if we choose to do so. We can walk to the supermarket, the nearby tapas bar for some tapas or a drink in the sunshine, 2 mins walk from a range of restaurants & bars and a 5 mins walk to the beach. Also, personally I am a swimmer and it is the only apartment complex that I have ever seen that has a proper 25m swimming pool with a shallow end and a deep end, perfect for swimming lengths or relaxing by the steps or in the shallow end. It is also set in a manicured garden meaning that your relaxing by the pool is not over concrete but cooling grass. Apartment is fully air conditioned, bedrooms & living area. Bed linen is provided for all beds based on stated occupancy at the time of booking. A washing machine is provided in the apartment for your convenience. The internet service and can be accessed on a pay as you go basis. Hand & bath towels are provided for each person based on the stated occupancy at the time of booking. Additional towels can provided at a small additional cost. Please bring your own beach towels. Kitchen basics are generally available in the apartment - tea, coffee, sugar, salt, pepper, a range of dried spices, olive oil, sunflower oil, sugar, dried pasta. There is a large dine-in kitchen and also a large 6-8 seat dining table in the lounge room for additional dining options. A hatch opens between the kitchen and lounge area for dining convenience. Library in the apartment for guests use, located in the drwaers of the living room side board. A range of beach buckets, spades, fishing net & peach toys for smaller children are available in the apartment. A range of popular family/general movies on DVDs are available in the apartment. Many local tennis courts can be found nearby. Large 25m communal pool in the complex plus a separate children's and toddlers pool. The apartment is a spacious two twin bedroom apartment on the 3rd floor of a 4 storey block with a lift and stairs to all floors. There is a 5th fold out bed (for a child) if required. It comes provided with all linen and towels at the start of your stay. The apartment rental fee is based on up to 4 people sharing. For a 5th person there is a small additional charge of €25 for additional bed linen and towels and water usage. High speed internet access is available at the apartment on a pay-as-you-go basis from periods from 1 hour to 1 month or longer. Apartment is situated in an excellent location of Calahonda. You walk out of the amazing complex and your right on the Main Street (strip) with lots of restaurants, pubs and ten minutes walk to supermarkets, beach and another shopping centre which also has shops, restaurants and pubs. We could not have asked for a better place to stay!! The apartment is spacious, clean and has everything you need with amazing views and you can see the sea in the distance. There are two swimming pools one is very large and never gets over crowded and the other ideal for small children. The grounds are very well kept. We would definitely love to stay here again as we have family in Calahonda. We hired a car and visited lots of places. The owner of the apartment Fiona is very friendly and helpful to. Thanks for making our holiday so enjoyable. Great apartment, great location and fantastic pool. The apartment is huge, spacious, cool and also gleaming. We were delighted with the big bedrooms and huge living area. We were never on top of each other. It has a great location only a couple of minutes walk from bars and restaurants and a big supermarket. Just outside the complex is a street of restaurants including great Tapas bar at the front of the complex - we sat outside there many evenings for drinks as well as food. Calahonda is a really nice area and not as built up as Marbella or Fuengirola. We found the owner very helpful to deal with and she answered all our questions and we were very pleased with the service. I can see why this apartment gets great reviews and is often booked up. It’s great for children in the summer with a large pool area, it is also perfect for a couple wanting a peaceful holiday, it’s not near any loud bars or nightclubs which was a big relief. We are very pleased so thank you! Amazing apartment, spacious & bright & sparkling clean - brilliant location! We were really impressed with this apartment, all the photos are exactly as we found the apartment. All rooms were a great size, plenty of space for everyone. The main living area was light and spacious and really comfortable and bedrooms were large. The main balcony looks out towards the sea, we had breakfast there most days and it was November! There is air conditioning throughout for heating and cooling depending on the season. Comfortable beds and a fully equipped kitchen - we loved the orange juicer! Parking available in the gated car park area which was good. Lots of restaurants a few minutes walk from the apartment and large supermarket 5 mins away too. The owners were very helpful and easy to deal with, we would have no hesitation in recommending this apartment to anyone. It's always nerve wracking when you pull up to the place you have saved your money for and chosen to stay in for your holiday. We were pleasantly surprised every step of the way. The appartment has secure parking and is situated in a lovely neighbourhood good for families and couples alike. The surrounding apartments were a mix of residential and holiday lets which meant the pool wasn't jam packed with keen holiday makers. It's a good sized pool with a seperate toddler pool which is perfect for the kids and also for adults to get a good swim in. There is also a lifeguard on duty which set our minds at rest with having children. The pool and outside area was very clean and well kept. The appartment itself was spacious, bright, well equipped and well decorated. There were a few supplies such as cooking oil, washing powder, lilo and a bucket and spade for our use which was extremely handy. The area has a few bars and restaurants, we'd recommend christoffs and bogarts for good, traditional reasonably priced Spanish food, both within a short walk of the appartment. The nearest beach was walkable, it was a fairly quiet beach with a couple of places to eat. We found another beach which was a 10 minute drive away called cabbapino beach which had better facilities / more varieties and was shaped into a cove so was safer and the water was calmer for the young children to play in. There were several local supermarkets but the one we preferred was lidl as it was cheaper and had a larger variety. Everyone in the area was pleasant and friendly. Everything about the stay was enjoyable. Communication when booking the appartment was good and nice that it was a personal response from the owners. I would highly recommend booking this appartment. Apartment very clean and in a good position. The only thing I feel lets it down is the cooking facilities , oven very small. Ideal for 2 people unless you like to eat out every night. Really nice and spacious and clean apt, family of 2 adults and 3 kids aged 12 to 7 had plenty of space and comfort, Fiona was very accomodating and easy to deal with. Apt very central to Restaurants and shops and pool had an extremely attentive and friendly life guard, local beach a bit rocky but Andy's beach a few km away was lovely. Would definitely go back to holiday there again. Located at the start of Avenida de Espana, the apartment complex is situated at the start of the main avenue in Calahonda, an avenue with a selection of local bars and restaurants and local grocery stores. The complex is also only 4-5 mins walk back to the main commercial centre in Calahonda called El Zoco, which has a large Supersol supermarket, cafes, bars and restaurants, newsagents, an internet cafe, a bookstore, car hire companies, a taxi rank and a variety of banks and other shops. Tennis courts and a range of golf courses are also available locally along with the wonderful beaches of the Costa del Sol. Close to the historic Spanish towns of Mijas and Marbella and only 30 minutes drive from Malaga airport. 1. A 5th person in a booking will incur a small additional charge for provision of a 5th bed (full size bed) with linen & towels. 2. Sunday check ins/check outs may incur an additional cleaning fee of €50 as this is out of hours for our cleaning service and incurs an we incur a double fee for Sunday preparations and check ins and check outs. 3. Guests have the option to avail of the high speed WIFI internet service which is available at the apartment. The service is available for any length of time from 1 hour to 1 day, 1 week to 1 month or any period as required and usage is on a pay as you go basis upon initial login to the local internet service provider via the apartment WIFI router. 4. The pool is open for the Easter long weekend, all weekends in May and from 1 June to early September each year. It has a full time lifeguard at all times that it is open.